Veterans have the character, discipline and skills needed to succeed as small business owners and entrepreneurs. Wondering what it takes and how you can prepare? Enroll in Boots to Business Reboot. Boots to Business Reboot is a two-step training program that provides participants an overview of business ownership as a career vocation, an outline and knowledge on the components of a business plan, a practical exercise in opportunity recognition, and an introduction to available public and private sector resources. Step one is the Introduction to Entrepreneurship course eligible to Veterans of all eras, service members (including members of the National Guard and Reserve) and their spouses. This course is instructed by SBA and its partners, who are skilled business advisers. Step two is one of the online follow-on courses instructed by a consortium of professors and skilled business advisers from the SBA Network. Please email the team at boot-to-business@sba.gov if you’ve already attended an in-person Boots to Business class, and wish to sign-up for an online course. The next class in Houston will be at: Combined Arms, 2929 McKinney Street, Suite #A, Houston, TX 77003. Wednesday, May 1st, 8:30 am - 4:00 pm. Seating is limited so you'll need to register right away. It's time for a little Financial Spring Cleaning! April 11: Veteran Resource Workshop: VETERANS, LET US SERVE YOU by helping your small business startup, succeed, and grow! This FREE workshop will introduce you to the resources that are available to help you plan or grow your business, learn about federal contracting opportunities, and find financing. April 12: Is Your Small Business Burdened by Federal Regulations? Join this small business regulatory forum to tell us about the federal regulations that concern you the most. This will be an opportunity for small business owners and those who represent small businesses to educate the Office of Advocacy through first-hand accounts of how they are impacted by federal regulations. April 15: Federal Grants to Fund Your Innovations: Did you know $2.5 billion of funding is granted each year to support small business innovation? This SBIR workshop begins with some basics of the SBIR/STTR programs and then covers the process for developing a competitive proposal, and ends with Q&A session. April 23: SBA/USDA Economic Roundtable: Attend to learn about the assistance and loans offered by the SBA, USDA- Rural Development, USDA- Farm Service Agency and other support organizations that can help you start/grow your business or improve your community! April 30: Doing Business with the Federal Government- Certifications Workshop: As the owner of a small business you might be able to earn your share of this huge market! You may qualify for SBA Federal Government enhancement programs based on a variety of factors including the primary location of your business and your social/economic status. Most business owners will tell you they really don’t enjoy working the numbers for their business. It’s probably their least favorite part of running a business. We understand so we have designed this session with you in mind! Our expert trainer will break it all down so you can easily understand what the numbers are telling you about the financial condition of your business. Your company culture is the foundation of your success, it is critical when it comes to hiring, retaining and engaging top talent. Understanding your vision, mission, and value statements is the first step in designing your culture in a deliberate way. Even if you’re too busy to focus on designing your company culture, your company will have a culture without your active participation, and it may not be the one you want. This seminar is a must for prospective entrepreneurs and a proven benefit to many already in business. It is a powerful program that's packed with information, tips and techniques needed to start a new business as well as improve an ongoing enterprise. Seminar leaders are men and women professionals, each with over 20 years of business experience, who have created this seminar and presented it to thousands of potential and existing business owners. They'll make sure you'll leave this seminar with skills and insights on how to run a successful business. or planning to grow their business. The three primary considerations are; (a)Choosing a legal business structure, (b) Understanding government rules and regulations, and (c) Buying business insurance. April 24: Fujo de Fondos La Administración de Fondos es el manejo eficiente de efectivo en tu negocio. Es poner el dinero en efectivo a trabajar de manera productiva de manera que produzca ingresos. La administración cuidadosa de fondos permite al empresario estimar el dinero necesario a tener a la mano en cualquier momento y evaluar si tendrá un déficit o un excedente. 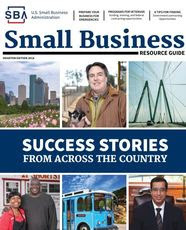 All the information you need to start and grow your Small Business in Houston can be found in our online Resource Guide. Download it today!